Launching at Analytica, the latest shaking incubator from Stuart® is specially designed for use with microtitre plates to meet the needs of life science labs. Offering the ideal shaking action for mixing very small volumes in well plates or micro tubes, the SI505 also dramatically reduces sample evaporation and features state-of-the-art microprocessor detection, setting and control of temperature. 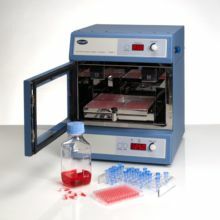 The SI505 complements Stuart's highly successful SI500 shaking incubator, incorporating the same digital display, retractable stainless steel platform giving easy sample access, and USB connectivity for long-term monitoring of the incubator temperature on a PC. Up to four microtitre plates fit on the non-slip mat and a range of accessory racks for different tube sizes are also available for the SI505. The integrated timer can be set for any period from 1 second to 9 days and speed and temperature are independently controlled. An easy-to-use digital LED control panel enables temperature to be set between ambient temperature +7°C and 60°C, while air distribution is controlled to ensure uniformity throughout the sample chamber. In common with other Stuart® benchtop equipment, the new shaking incubator benefits from BioCote® antimicrobial protection as standard. This silver-based technology reduces the risk of cross-contamination and infection within the laboratory by eliminating surface level bacteria, mould and fungi.